A Mexican reporter renowned for coverage of organized crime was killed in the lawless state of Sinaloa, and gunmen attacked an executive of a small weekly magazine in Jalisco on Monday May 15, as authorities struggle to contain renewed bloodshed between drug cartels. Javier Valdez was killed when assailants opened fire on his car in the state capital, Culiacan, according to RioDoce, the media outlet he co-founded and where he worked. Reuters reported Valdez was the fifth reporter killed since March, making Mexico one of the deadliest countries for journalism at a time when murder rates are at their highest since the peak of the drug war in 2011. 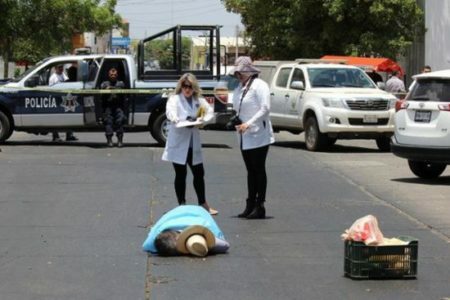 In Autlan, in the neighboring state of Jalisco that is the territory of the ascendant Jalisco New Generation Cartel, gunmen opened fire on Sonia Cordova, an executive at the Semanario Costeno weekly magazine. Cordova was wounded and taken to hospital and her adult son was killed in the attack, the state prosecutor’s office said. A state police source said her son, Jonathan Rodríguez Córdova, worked as a reporter at the family-run magazine, which publishes local news that includes some crime reporting. Autlan is best known as the birthplace of rock musician Carlos Santana. Valdez was one of Mexico’s most well-known, and loved, chroniclers of the drug war, winning the International Press Freedom Award from watchdog group the Committee to Protect Journalists (CPJ) in 2011 for his prolific coverage of trafficking and organized crime. News of his slaying shook Mexico’s journalism community, already alarmed by a spike in attacks against the media this year. Mexico is one of the most dangerous places to be a journalist, with the vast majority of attacks on the media unpunished. A group of reporters said last weekend a large group, including children, carrying semi-automatic weapons took their equipment while they covered unrest in the state of Guerrero. Valdez also contributed dispatches to the national daily La Jornada and published a book last year about the dangers facing journalists who report honestly on the rampant crime and corruption gripping Mexico. Mexican and foreign journalists paid homage to Valdez on social media, describing him as a courageous writer and generous friend whose killers must be brought to justice to deter future slayings. “Tears in my eyes, hearing of the murder of Javier Valdez Cardenas in Culiacan, one of the best writers and journalists of Mexico,” British author Ioan Grillo said on Twitter. Photographs from Sinaloa showed Valdez’s body in the middle of a street, the brimmed hat he often wore lying among a dozen yellow markers for bullets. Mexican President Enrique Pena Nieto and the U.S. ambassador to Mexico condemned Valdez’s killing. A special federal prosecutor’s office tasked with crimes against freedom of expression said it had started the procedure for opening an inquiry and was sending a team to collect evidence. “The state must respond to these circumstances,” said Sinaloa prosecutor Juan Jose Rios at a rowdy news conference. Journalists shouted questions asking what would prevent them from being next. The special prosecutor’s office rarely opens probes into the killing of journalists, leaving the job instead to local authorities, according to the CPJ. “Javier’s murder is an attack on independent journalism not just in Sinaloa, but in Mexico as a whole,” said CPJ’s Mexico representative Jan-Albert Hootsen.